Shredding private and confidential files is imperative to your business. Removing staples, paper clips, and rubber bands to feed documents through an office shredder costs time and leads to loss of productivity. Sugar House Archives & Shred’s mobile shredding service offers the convenience of having your paper records shredded on-site at your business. Mobile shredding is efficient, secure, and does not require any time or labor investment on your part. 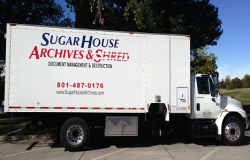 Sugar House Archives & Shred’s mobile shredding trucks will travel to your location on a scheduled or as-needed basis so that you can witness the shredding of your confidential documents without leaving your office. We simply drop off locked containers at your office in advance. Once they are filled, our professionals will take your containers directly from your office to our mobile shredding truck, where the containers are weighed and the contents are shredded. Since our trucks use industrial strength shredders, your documents are shredded in a matter of minutes. Upon completion of your shredding project, you will be issued a certificate of destruction documenting your due diligence and compliance with all laws and regulations. Depending on your business needs, Sugar House Archives & Shred will establish a recurring weekly, bi-weekly, monthly, or quarterly on-site shredding schedule. We can also assist with one-time purge projects. Sugar House Archives & Shred’s mobile shredding services provide your business with a formal document destruction solution that maintains the confidentiality and security of your information. If you are interested in Sugar House Archives & Shred’s Mobile Shredding service, please contact us by phone or fill out our form.